We advertise most of our OEM rims as being “like-new” unless otherwise stated. Sometimes, customers call in and are a little confused about that wording. So, are they new? Are they used? What does this all mean?? Take a deep breath, relax, and we’ll break it down. They look like new… but without the new price! 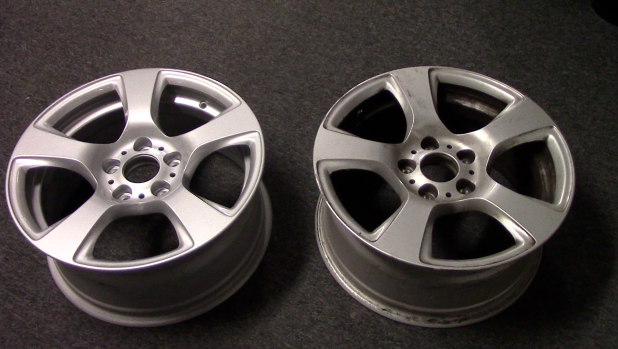 We specialize mostly in selling used OEM wheels; meaning they have previously been on a vehicle. So in that sense, we wouldn’t be able to call them new or brand new. However, in most cases our wheels have been cosmetically reconditioned to look like new. A bit about our criteria for stocking our inventory: we do NOT purchase factory wheels that have been previously cracked, bent, or welded. Every rim we have is going to have great structural integrity and spin straight. If a wheel has had a small weld, or if it does spin a little out of round, we always let our customers know. So, let’s say we get a part number 59611 in for inventory. By the way, that’s a silver BMW 3 Series wheel, pictured below! We’ve inspected it, and everything checks out; it spins great, nothing is bent, no cracks… BUT, there’s a bit of curb rash, or maybe the paint is peeling. In this case, we would sand the wheel down and re-paint it using the same paint code as the factory; ensuring the rim looks new again! On the left; part number 59611 reconditioned. On the right; the same wheel, but has not yet been reconditioned. For silver, hyper silver, or other painted stock rims – it’s just as we described above; wheels get sanded down and then get a new coat of paint. Hyper silver starts off a little different in that it gets a grey or black primer before putting the silver over it, which creates a smokey look. Machined wheels get put through a CNC lathe and then covered with a clear-coat for protection. Chrome wheels are stripped and then chrome-plated again, giving them a brand new chrome look without the brand new price. Sometimes chrome wheels can get pretty pricey when coming from the dealer! For our steel rims, we bead blast them and then we paint them with either a black, silver, or white paint. There are cases where a wheel cannot be reconditioned and we just have to sell it as-is. Cladded chrome wheels fall into this category. We’ve talked about them before, but just in case, cladded chrome wheels have a chrome covering bonded to the face of the wheel. This “cover” cannot be removed or replaced, so nothing can be done to it, and you can’t just buy another cover. For this reason, clad chrome wheels are usually described as “like-new take-offs” meaning they were taken right off the vehicle and must be purchased in whatever condition they were when they came off the car. There are times when even regular chrome wheels can not be reconditioned, and the same rule applies to them. Take-offs don’t always have to apply to chrome clad wheels, but any wheel that was taken off of a vehicle. Sometimes, we see take-off rims that never really had any damage done to them. They’re really clean wheels that we feel don’t need to be reconditioned, so we sell them as-is. I guess what we’re trying to say is… when ordering from us, rest assured you’ll always receive factory rims that are in immaculate condition! Anything less than that, and we’ll do our best to help you out with descriptions and even pictures if we’re able to do so. Stock wheels that look like new, but without the new price… sounds great to me!